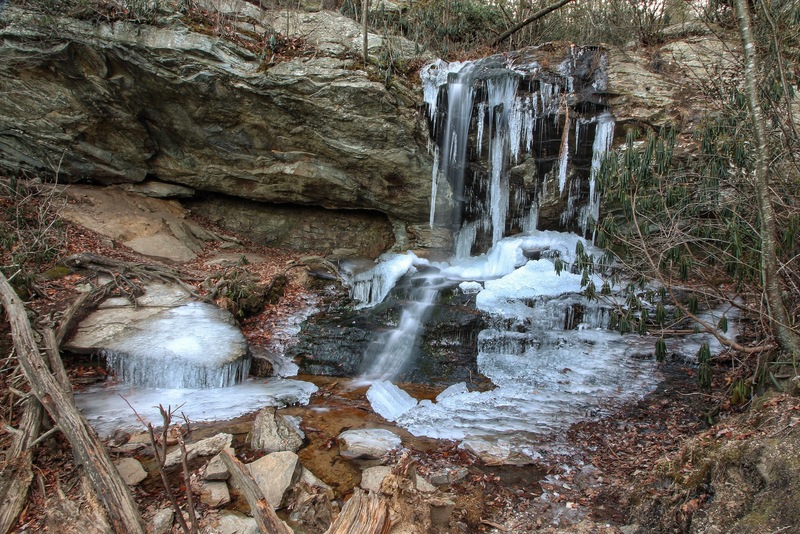 Usually, to see frozen waterfalls in Western NC, one must go further west and up in elevation. 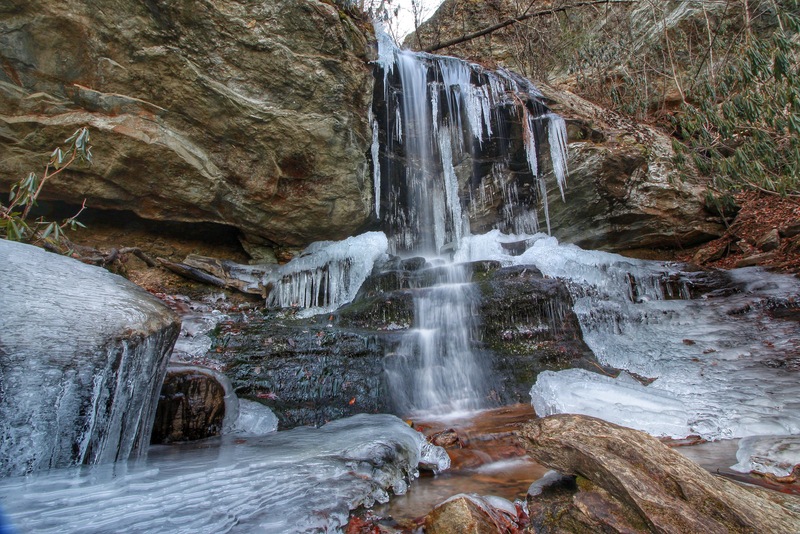 However, on our 4th night in a row of temps in the teens and single digits here in the lower elevations, I had a feeling that our small waterfalls at the nearby Hanging Rock State Park might just freeze up. It is a Sunday morning and is the last day of temps this cold, before rain and slightly warmer air moves in. So, I fought all instincts and got out of bed very early on a frigid morning and headed out just after the park opened at 7 am. I wasn’t expecting much company as it was 12 degrees in the visitor center parking lot. It was quite frosty, as I started out. 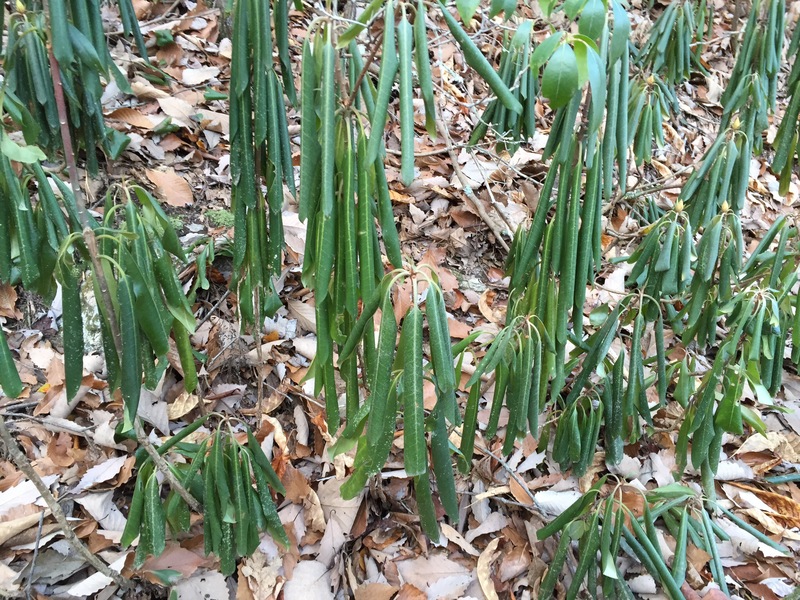 The rhododendron were all doing their cold weather thing where the leaves curl down. 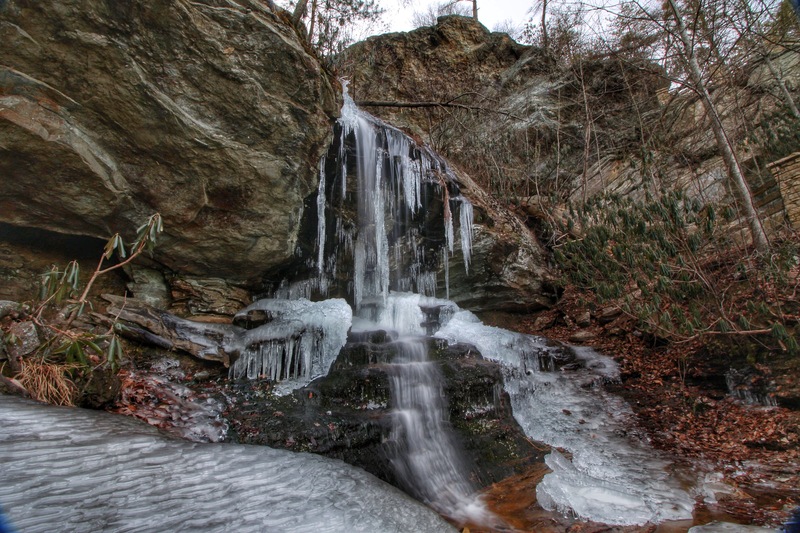 There are 5 waterfalls in Hanging Rock State Park, all of which are pretty easy to get to. There was one in particular that I thought would look good today, Window Falls. 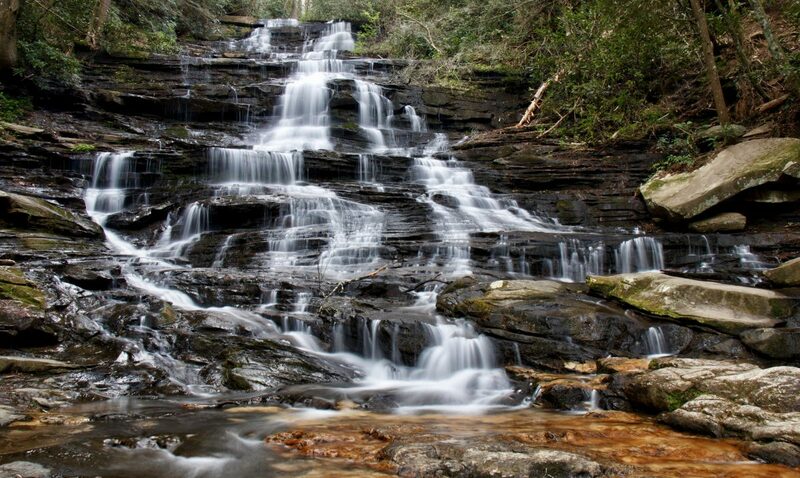 It is a 25 foot waterfall with some free fall and cascading action mixed in. Normally it benefits to see this after some rain as the creek it is on, Indian Creek is very small. 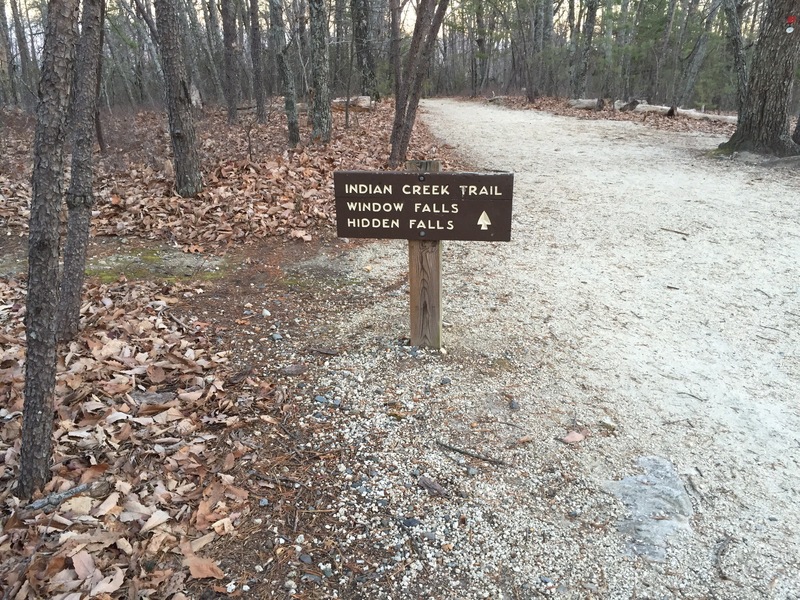 The hike starts at the far end of the parking lot, just past the trail head for the Hanging Rock Trail. 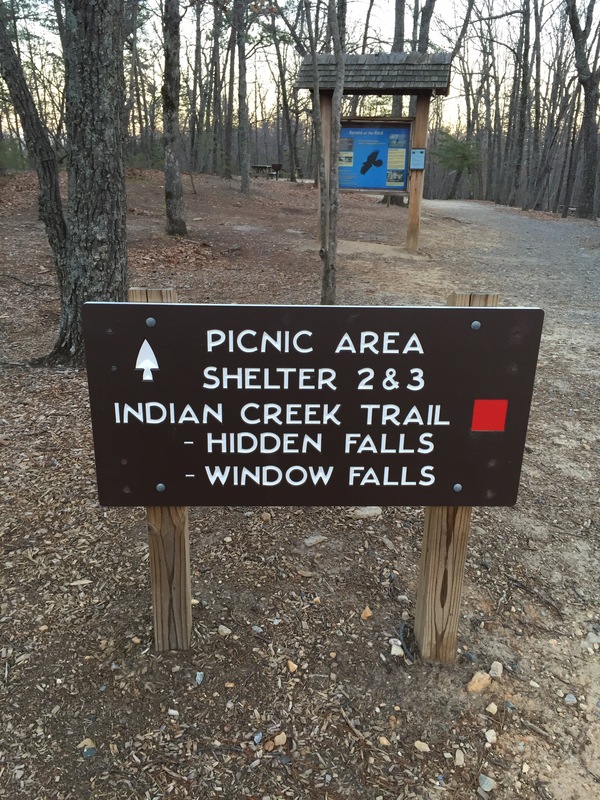 It is maybe 0.6 miles down a mostly “slightly” downhill path, passing numerous picnic shelters. The path is very wide and distinctive and is called the Indian Creek Trail. The MST or Mountains To Sea Trail also runs along this. 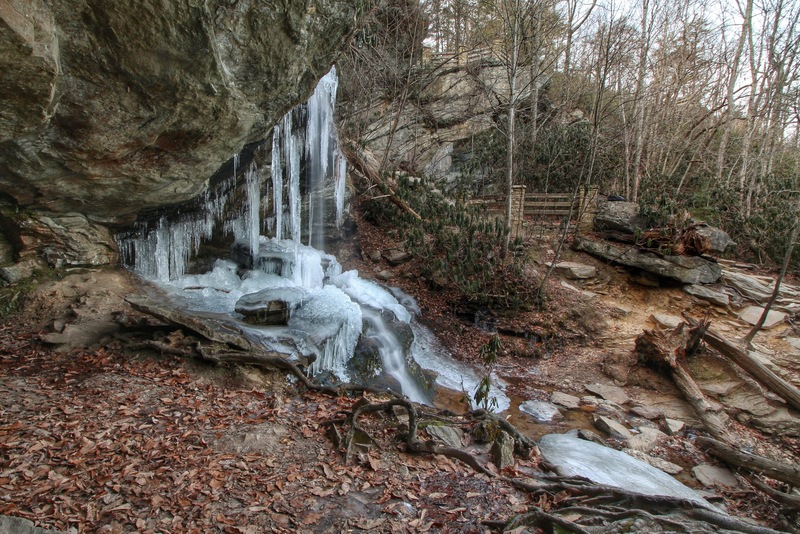 Just as the trail makes a sharp left turn at Indian Creek, there is a very short path to the 10 foot Hidden Falls. Once down the trail another 0.2 miles, the top overlook of Window Falls appears. Here the “window”, or hole in the rock cliff wall can be seen to the right, while the waterfall is down hill to the left. Follow the steep stairway down to the base and there are numerous photo opportunities. Window Falls can be walked behind and is a treat on a hot day,….this was not that day though. As I approached , I saw lots of ice…just what I was hoping for! Crossing the stream here is pretty easy, but getting up to the base was a challenge with the rocks being covered in ice. Once across and up the icy rocks, I was able to get some good views and some photos. The trip back up includes a little huffing and puffing, but nothing strenuous. This short hike gets you to 2 of the 5 waterfalls here. Another trail starts way across the large parking lot to “Upper Cascades”. The other 2 falls are accessed outside of the main park along some side roads. Here is a short video I took of Window Falls. That’s really nice looking, tons of ice!! Thank you Sondra! 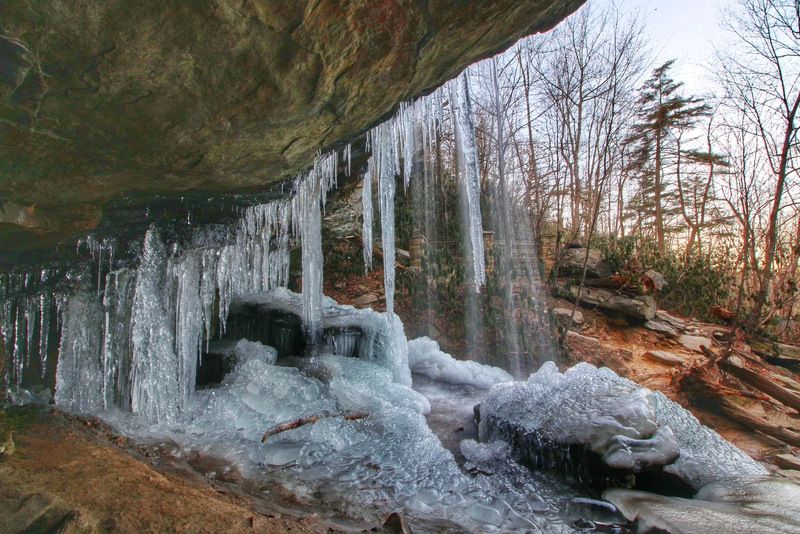 It is rare to see this much ice at this waterfall. I was blessed!